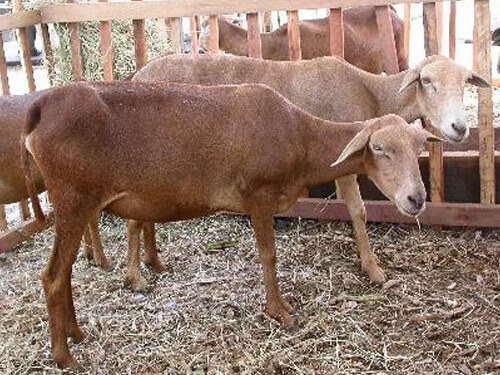 Morada Nova sheep are found in northeast Brazil but probably of African origin. They may also be related to a Portugal breed called Bordaleiro. They originated from selection of individuals of the Brazilian Woolless. Both sexes are polled. The rams do not have a throat ruff. It has been reported that they have a litter size of 1.32 to 1.76. The predominant color is red to cream, but white animals are also found. The breed is small with mature lamb and ewe weights of about 40 (88 lbs) and 30 kg (66 lbs), respectively.